FREE SHIPPING on Shoes and Etsy Goodies! 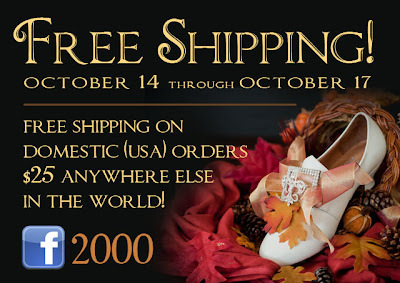 To celebrate the American Duchess facebook fan page collecting 2,000 followers, we're offering FREE Domestic Shipping on, well, EVERYTHING! Get free domestic shipping on shoe and buckle orders at www.american-duchess.com . Also, international shipping is $25 anywhere in the world! Also get free domestic shipping on any Etsy shop item, including vintage patterns, t-shirts, and shoes, at http://www.etsy.com/shop/americanduchess - enter coupon code "2000FANS" at the Etsy checkout. The 2,000 Fans Free Shipping Celebration goes all weekend, but ends Monday, October 17, so don't wait! I would like to tell you that you can add your Etsy coupon to http://etsycouponcode.com to get max exposure and increase sale chances!